Will Your Porcelain Veneers in Newark Get Stained Over Time? If you’ve recently gotten porcelain veneers, congratulations! They’re an excellent way to hide countless smile imperfections and completely transform your appearance. But while there’s no question that they look great at the start, can you count on them to continue looking great well into the future? You’ll be glad to know that you can! Learn more below about why porcelain veneers in Newark are stain-resistant and also find out the best way to maintain them over the long-term. 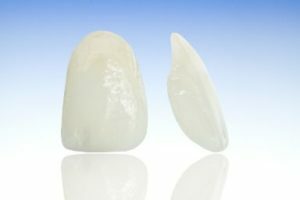 Why Don’t Porcelain Veneers Get Stained? Staining has to do with porosity. When a surface is porous, pigments from things like coffee, tea and red wine can easily adhere to it, which leads to staining over time. In fact, that’s why your natural teeth get stained so easily. You can’t see it with the naked eye, but your teeth are covered in tiny “pores” that allow them to detect chewing pressure, texture and temperature from the foods you eat. Unfortunately, these are the same pores that absorb pigments from your diet. It reflects light more like real teeth do, so it looks very natural. It doesn’t absorb pigments from foods and beverages, so your daily coffee habit won’t cause your veneers to turn yellow over time. It helps give porcelain its strength, making it more resistant to chips and cracks. Even with all the advantages of porcelain, it still requires some basic maintenance to help it look great for as long as possible. How Can Keep Your Veneers Looking Great? Get regular dental care from a cosmetic dentist in Newark. This way you can make sure the margin (the line where your veneer and natural tooth meet) stays healthy. It’s also nice to have them professionally polished twice a year. Don’t chew or bite on anything hard, such as ice or hard candy, because you might chip or crack your veneers. Use a non-abrasive toothpaste so you don’t scratch or dull the surface of the porcelain (also avoid whitening formulas because they’re more abrasive than other varieties). Using a gel is another option for making sure you’re using a gentle product. With these tips, your porcelain veneers will look and feel great for many years! Dr. Donald Bond is a general, restorative and cosmetic dentist in Newark who has found that porcelain veneers are one of his most popular cosmetic procedures. Patients love the fact that they can count on them to look great right after being done – as well as many years after. If you have any additional questions, he can be reached via his website or at (302) 731-4225. Comments Off on Will Your Porcelain Veneers in Newark Get Stained Over Time?